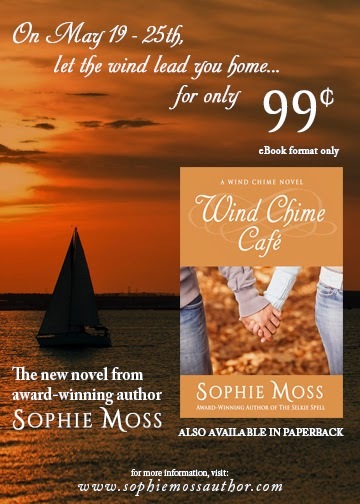 Wind Chime Cafe by Sophie Moss, one of our favorite contemporary romances, is on sale for .99cents until May 25th! To celebrate we're sharing a little excerpt and a giveaway! You can also find our review of Wind Chime Cafe here. Will’s hand closed over Annie’s as they crossed the parking lot to the quiet neighborhood street leading back to the café. Becca and Ryan had decided to stay for another drink at the bar, which meant…she and Will were alone. Heading back to her place for the night. She was the one who’d started this. She was the one who’d decided to take this step. But was she really ready? Was she really going to do this? Risk her heart like this? It was only one night, right? Then why did it feel like so much more? She lifted her gaze to his. In the moonlight, his eyes seemed impossibly dark. Dark and deep and full of secrets. She couldn’t stop thinking about what Colin had said at the table, that Will could get out of any trap, any bind, any knot. Did he see her as a trap? As someone who would tie him down, make his life complicated? He could get out of any knot, but she was just learning how to tie them. All she wanted was to root herself to this island with as many knots as she could. But didn’t she? Didn’t she know exactly what she was getting into? There was no way she would have decided to spend the night with him if she wasn’t already halfway in love with him. And if she was already halfway in love with him, there was no way he could leave now without breaking her heart. He ran his thumb gently over her bottom lip before his mouth lowered, brushing over hers. Butterflies, low in her belly, began to stir. They floated up, fluttering tentatively, then flapping their wings faster, until an orange glow fanned out around her heart. The word pulsed inside her, a reckless hope that built with every beat of the wings. 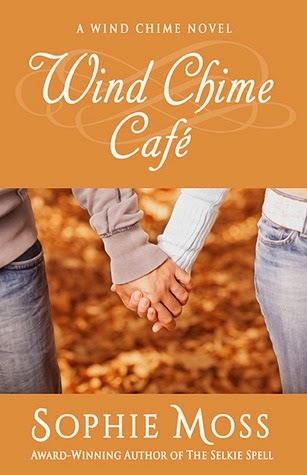 Wind Chime Café was released on February 7 2014 and is available from Amazon for .99cents until May 25th. 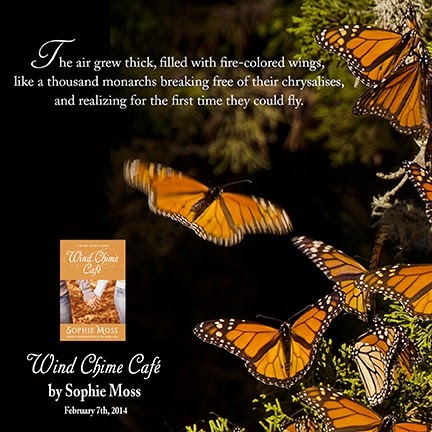 You can find our review of Wind Chime Café by Sophie Moss here.